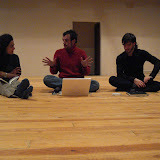 Here we post some photos from our first meeting on February 2007 in Barcelona. We're still waiting for the photos from Jordi (our friend/photographer that was taking photos in the studio, i don't know if you remember him...) as soon we have them we will post them here. If you have more photos and would like to post them in our blog, please send by e-mail to our blog e-mail adress: mediencounter@gmail.com.